Forex markets demonstrate exchanges between different currencies and their prices relative to that exchange. Understanding charts are very important and can be an extremely useful tool in trading Forex. Prior to learning how to read them and how you can use them to make money trading, you should understand what exactly goes on in a forex market chart. Charts Are Relative to a Parameter – Foreign exchange market charts are always relative to a certain parameter. The most basic chart type in Forex, which you’ll also be using the most, is the standard line graph. A line graph houses two axis, the X-Axis, and the Y-Axis. Charts demonstrate something. The most common chart, a line graph, shows the performance of one parameter over the length of a different parameter. 1.) The trading pair 2.) The exchange rate (price) of the trading pair, 3.) Length of time the exchange rate of the trading pair has been recorded. In the most standard and most likely used average format of this type of chart, the parameters are used in the following notion; on the Y-Axis, you have a scale that shows the prices that the trading pair has previously obtained. On the X-Axis, you have a start date for where the data recording starts, and then an end date for when the data ends. Let’s look at the above chart of USD/JPY courtesy of DailyFX. At the title of each graph, you will have an overview indication of what it is you’re looking at. 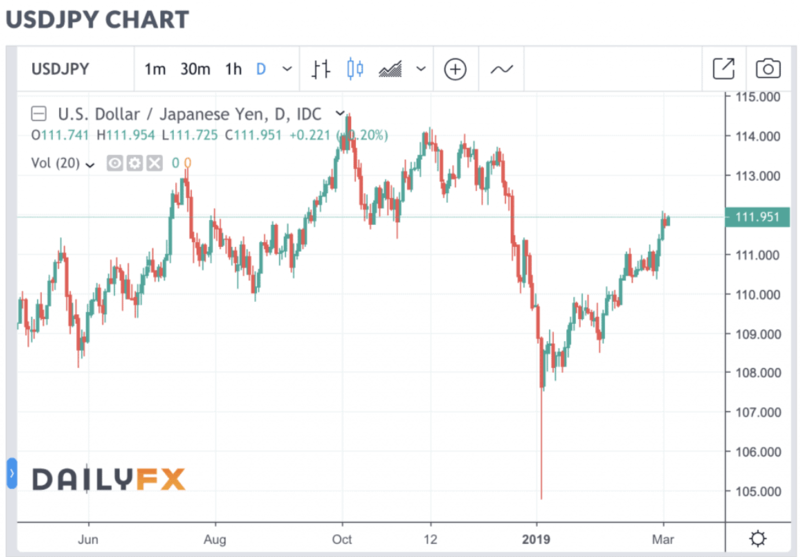 In this case, this is the chart for the price of “USD/JPY“, in other words, the amount of USD that can be exchanged for JPY over the period of a year. On the X-Axis you can see the time indications, which are marked by Months (Time). Then as we previously mentioned, on the Y-Axis, we have the price points at which the USD/JPY pair has attained. Now, let’s delve a bit deeper into the graph. The exact price points may simply look like the prices at which USD/JPY has obtained previously, correct? Yes and no. The above chart is one of the most used and probably most important chart type that you’ll come across, called a Candlestick Chart. A candlestick chart is a type of chart that shows the performance of a currency over time through the form of “candlesticks”. Candlesticks are visual representations of price movements of an underlying currency from its open price, close price, as well as its price increase/decrease relative to the price of the currency on the previous close. This might sound confusing at first, but let’s dive in; candlesticks are a concept that can only be learned with practice. Looking at this chart, each candlestick represents a “Day” of price movement for the USD/JPY pair. Each green candlestick means that on this “Day”, the price of USD/JPY closed higher than what it closed on the day before unless we are talking about the most present candlestick on a candlestick chart. In this case, the candle will be green or red depending on whether or not the price on a “Day” opens relative to the previous day. If it opens higher, then in realtime the candle will appear green. 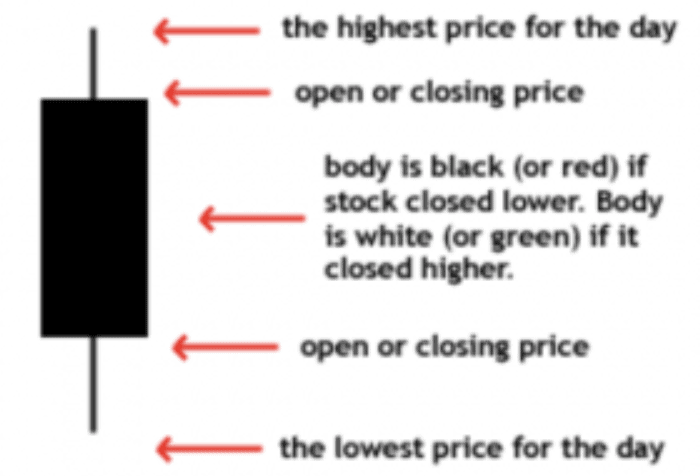 The following image, provided by Investopedia, demonstrates the anatomy of a candlestick on a chart. The topmost part of the candlestick indicates the highest price achieved by the pair during the day; the second topmost is which price the pair opened or closed the day at; the body of the candle extends only as far as the fluctuation in price during the day. The bottom of the body indicates the subsequent open or closing, and then finally, the bottommost part of the candle represents the lowest price attained during the trading period. Analyzing these sorts of charts are necessary to get a better grasp for Forex trading but are also extremely necessary for learning how to maneuver any financial market. Learning the functionality and basis of a candlestick chart will be invaluable in your overall trading. The second chart that should be understood is the basic line chart. With (Hopefully) newfound knowledge in Candlestick Charts, understanding basic line charts will be easy. Line charts are primarily useful in Forex trading for a preliminary overview of price action. If there are 4 trading screens open across your trading desk, you may not want to know the exact details associated with price action that candlesticks provide. Sometimes you simply want to know the general direction. Basic line graphs are excellent for that purpose. A line graph displays data in a similar manner as a Candlestick Chart. A basic line graph/chart will overview the price of a certain trading pair over a certain time period. However, it will only ever demonstrate a singular parameter through the chart: which is the close price of the trading pair. Here is the same trading pair we viewed earlier with a candlestick layout, except now replaced with a basic line setup. Here you can see we have a very broad overview instead of exact closes, opens, and daily movements, and sometimes that’s the only thing you want when looking at a trading pair. This chart is extremely simple in terms of composition: on the Y-Axis, we have the price of the range of prices the trading pair has previously attained, and then on the X-Axis we have our variable of time, which is in months for this specific graph.